Maintaining one of the foremost collections of postwar art in the central United States. 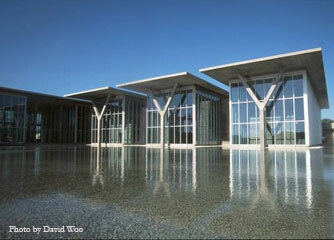 The Modern Art Museum of Fort Worth, designed by the world-renowned architect Tadao Ando, is a striking building that embodies the pure, unadorned elements of a modern work of art. It is composed of 5 pavilions of concrete and glass set on eleven naturally landscaped acres including a 1.5 acre reflecting pond. The Modern maintains one of the foremost collections of postwar art in the central United States , consisting of more than 2,600 significant works of modern and contemporary international art. Various movements, themes, and styles are represented, including Abstract Expressionism, Color Field painting, Pop art, and Minimalism, as well as aspects of New Image Painting from the 1970s and beyond, recent developments in abstraction and figurative sculpture, and contemporary movements in photography, video, and digital imagery. The new Modern features a state-of-the-art auditorium for lectures, film screenings and performances and an expanded education center for classes, and hands-on workshops. Visitors to the Museum can also enjoy a fine dining experience in Café Modern’s elliptical dining room set on the Museum’s reflecting pond or shop for unique gifts at The Modern Shop.